Kitchen and Residential Design: What do I do with my old stuff? I have an appointment this afternoon with a new client. We're getting together to put the final touches on a plan that will take her condominium at the beach from its existing state of mid-'90s builder chic to something more contemporary and a lot more her. 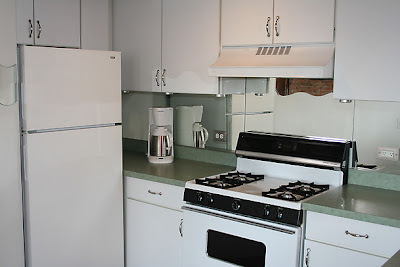 However, she has an entire kitchen full of perfectly usable cabinets and appliances. She has furniture, window treatments, plumbing fixtures, etc. : all of which will being removed and never heard from again. The stuff's usable and clean, just old and outdated. My client's not alone in this. I mean, what do you do with your old stuff when it's major renovation time? Throwing it away isn't the answer I'm looking for. Why not give that stuff to someone who can use it. The range still cooks, the fridge still refrigerates and that laminate cabinetry could last another 20 years in the right setting. There are two ways of getting rid of old stuff that I recommend to people. The first is Habitat for Humanity's ReStore on 118th Avenue in Saint Pete. Habitat for Humanity operates a retail store as a way of raising money to build houses for people who need them. If you have appliances that are less than 10-years-old, furniture in good condition, building supplies, etc. They will take your donated stuff, sell it and then put that money to good use. What a great idea. Your old stuff ends up in the hands of someone who will continue to use it and the money raised will go to an important cause. The ReStore on 118th is essentially a house-related thrift store, for lack of a better term. If you're considering undertaking a renovation project of your own some time soon and if you love a bargain, head over there. The directions are on their website. Also on that website is a call for volunteers to help run that store. If you have some hours you'd like to give to a good cause, consider them. Time spent outside of your life can be greatly rewarding. But in the meantime, give them your old stuff. My second pick is something called Freecycle. Freecycle is a worldwide network of local chapters whose goal is to bring together people who have stuff with people who want stuff. Freecycle's local group is in Saint Pete and you can go to their website here. There are in excess of 6,000 members of the Freecycle network in Saint Pete alone, and someone among them wants your old range and cabinetry, trust me. Freecycle isn't intended to be a one-way street. It's members give and take in equal measure. So in getting connected with someone who wants your range, you may get connected with someone else who has coconut palms they want to get rid of. Who knows what you'll fins, the important thing is you'll find something. Even if it's nothing more than a new home for your old stuff. Between Habitat for Humanity's ReStore and Freecycle, you are bound to find a place to put your old stuff that's not the landfill along 275 and that my friends is a great thing.